Yes, yes, this is a very eclectic mix of topics. I got up this morning and walked on the treadmill for 20 minutes! Seriously, I did. If you knew how much I love my sleep, you would have surprised face right now. I hope I’ll be able to make myself do this every morning, and also do some other kind of exercise in the evenings. We’ll see. 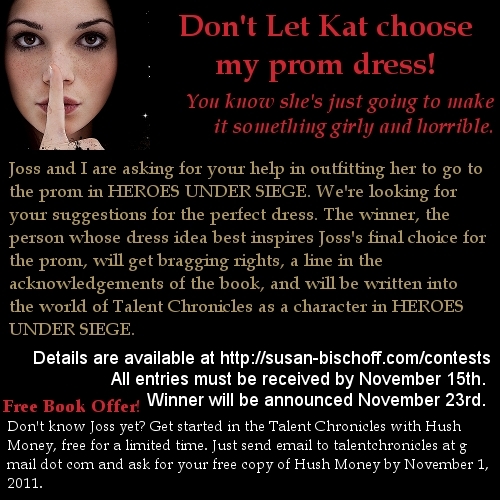 Also, Susan Bischoff is running a contest on her website. Click HERE for details. And, last, but in no possible way least, I’m going to Disney World on Sunday! I’m as excited as a little kid. I haven’t been there in years, and they’ve added so much stuff. There wasn’t an Animal Kingdom when I was there last. And I love rides, especially the roller coaster ones! The couple I’m going with (and their eight year old son) are afraid of roller coasters, so I’ll be riding a few of those by myself. My friend won’t ride anything scary, but her husband said he MIGHT ride a few of the scarier rides with me. I want to ride that cool coaster that has the Yeti that tries to get you! Okay, yes, I’m babbling. I TOLD you I was like a little kid. Yay on the exercise!!! And SUPER YAY on Disney World! We’re going in January. You are going to have so much fun at Disney! Can’t wait to take my son back in a few years. I was just telling my roommate how much I’d love to go to Disney World again! It’s seriously been over a decade, and, as much as I loved it as a kid, I’m pretty sure I’d love it even more now! Pirates of the Caribbean will always, always, always be my favorite ride! And Susan’s contest looks interesting! I’ll have to check it out…or get my roommate involved since she’s the one who -loves- dress hunting, so much more than I do, omg. I can’t remember when I went to Disney last, but I know my youngest son was pretty small, and he’s 22 now. LOL I really like Pirates, too. But then there’s the Haunted Mansion. And so many others! Thanks, Michelle. I woke up this morning with a horrible headache, so I didn’t get to do the treadmill. I was really disappointed. Are there do’s and don’t for Disney? Do have fun. Don’t not have fun. Hee hee. Great job on the exercise!! Hope you can keep it up. And have fun at Disney world!! I’ve never been there. Well, my mom says I have, but since she was pregnant with me at the time, I don’t think it really counts. Hoping we can take our kids sometime, but we want to wait until they’re both old enough to enjoy it. Thanks, FR. I hope I can keep it up, too. I went to Disney on a senior class trip and I was hooked. Then my mom took my best friend and me. I went a few times later, once or twice after I had kids. But it’s probably been at least 15 years since I’ve been. There are a lot of things that really small children might enjoy, but they tire so easily and then get cranky. I don’t know how old your kids are, but they would probably have the most fun after 5 or 6 years old.